In the spirit of encouraging others to try out vintage to see how they like it (and just get gussied up every now and then), Rubyellen and I have been inviting some of our favorite vintage wearing mamas to share how they wear it. 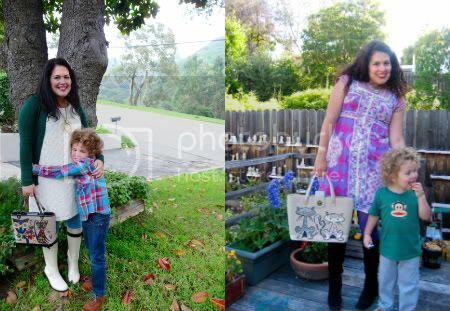 This week's Vintage Mama is Alix Tyler from sunny California! She and her son, Wolfgang (otherwise known as Wolfie), have quite the collection and know how to have fun with it! howdy, smile and wave & cakies readers. my name is alix and I’m so happy to be here! I’m the co-founder of modern kiddo, which is a lifestyle/fashion blog where my friend, dottie, and I share our passion for vintage kids goodies—clothing, books, toys, records, and more! 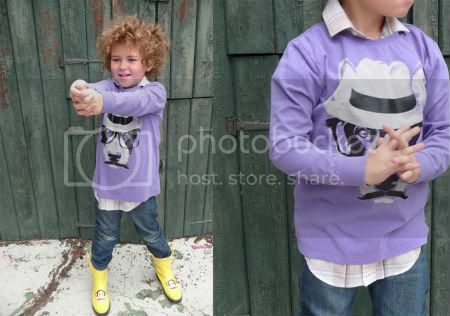 i am the proud mama to a little 6 year old charmer named wolfgang (although everyone calls him wolfie!). I’m excited to share some of our kooky closet with you guys! A: I grew up in Flint, Michigan in the 70s and 80s and honestly, vintage wasn’t really on my radar (or anyone elses!) in high school. I did a lot of theater and always loved dressing up, but then I went off to college in Cambridge, MA and my fashion world was rocked. Some friends dragged me to a store called “Dollar-A-Pound”. It was a rag and thrift shop and every Saturday they would literally take several bales of clothing and dump them on the floor. It was a mish mash of styles and eras. They’d literally hand you a trash bag when you walked in the door and you’d weed through these huge piles of clothes. It blew my mind! I was in heaven. There was a proper vintage store above this craziness, The Garment District, that I also loved. That was how I got my first taste of the “thrill of the hunt,” which is truly what makes thrifting so exciting. I love vintage for many reasons, but mainly because I love the colors and textiles…..and I don’t like to look like everyone else when I dress up! A: My favorite eras are the 60s and 70s, so if it looks like it’s from around that time period, it automatically goes in the cart! I’m also a huge color junkie, so that’s usually the first thing I notice—is it a cool pattern? A unique color or mix of colors? And of course I look for details, something that makes it “special”. Fun buttons, sweet trims, a cool cuff or collar. I think it’s also important to see the potential in an item. Don’t discount a dress because it’s too long or too short. Maxi dressed can be easily hemmed shorter and a mini looks sweet over jeans or even with a longer slip peeking out underneath. It’s all about getting creative! A: Oh wow, that’s a hard one! I really love ‘em all. Well I think my most exciting “scores” are finding those really rare pieces. I’ve found Pucci dresses and nighties for under $10….but I think my super fave score was one day at the Salvation Army. I was flipping through the racks and found an amazing Courreges dress. Andre Courreges was a major designer back in the 60s, famous for his space-age minis. His stuff is always written up in the 60s fashion books. It was a totally amazing dress. I remember snatching it and glancing around like “OMG, did anyone see this?? ?” I was giddy and kind of continued flipping through the racks, savoring the moment….when I found ANOTHER Courreges dress, just as fabulous. I was stunned. They must have been donated by the same woman. I still remember how insane that day was! Oh yeah, they were like $10 each. I have noticed that he always leans towards the more colorful options and that always makes me happy! We would also love for you to share some of your favorites places to find vintage or some vintage goodies you are currently coveting! chunky rhinestone necklaces, huge animal pendants, a yellow vintage cardigan, enamel flower pins, anything glitter lucite, an enid collins "LOVE" bag. 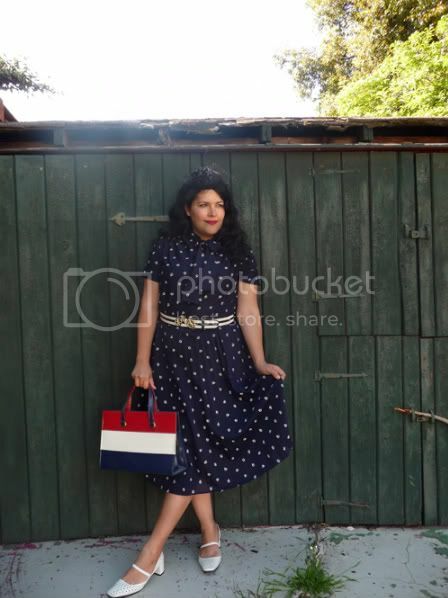 Thank you, Alix, for sharing your love for vintage with us! I love your vintage flair and will keep an eye out for that Enid Collins bag out here in Missouri. You keep an eye on that Wolfie of yours. I'm sure he's going to be the talk of the school in a few years (if not already)! Rubyellen and I will be sharing our vintage ensemble's later today so check back to see our pretties! OMG! That little boy is so stinkin' cute. In the one with the hat he looks like a young (and more handsome) bob dylan! So cute! I don't know if you have one yet, but do you have a list of places you shop online for vintage Rachel? that bicycle belt is too adorable! alix and wolfie are just plain cool! and i am so coveting that bicycle belt!!! thank you alix so much for sharing!!! Cool Blog...love all the vintage and retro you have going on! how stinking cute and stylish is wolfie?!? his mama's got great style. the most stylish mama/kid around!!!! i love alix's colorful style!!!! and wolfie well that kid melts my heart!!!! i second ruby i want that bicycle belt!!!!! YAY! you guys are so awesome, thank you thank you!!! love alix so! such great style! i hope to someday meet that wolfie! YAY!!! i love these two! 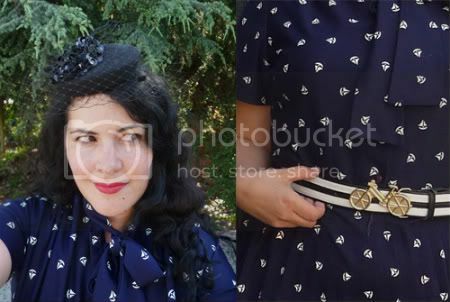 alix is always an inspiration, i love how she mixes up vintage and target and tiny hats and rhinestone necklaces and flower brooches in unexpected ways, she is my hero!!! 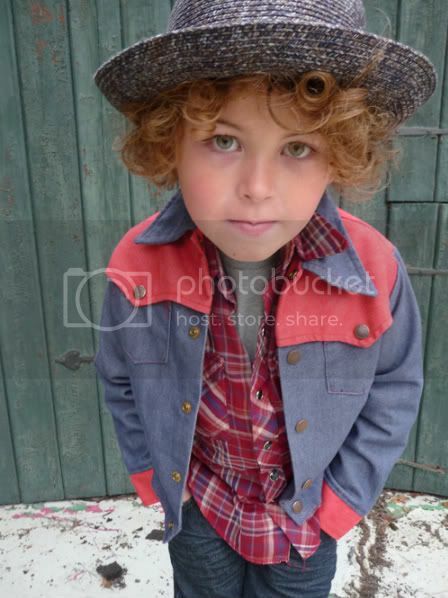 and that little wolf cub and his curls! looking so sweet in the pearl snap shirts.